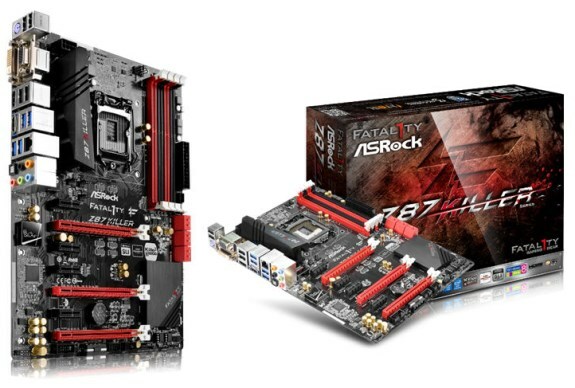 ASRock rolls out Fatal1ty Killer, a new line of motherboards with integrated Killer LAN chip. So far the lineup only includes the Fatal1ty Z87 Killer. If you consider online gaming as a fundamental belief, pwning opponents online as a religion that fulfils your life, and the pursuit of a fast and stable internet connection as one of your core values, then ASRock has the answers to probably not all but at least most of your life's questions: ASRock Fatal1ty Z87 Killer Series motherboards! With the integrated Killer LAN chip, serious players may game carelessly with no lag, just frag! No Lag, Just Frag with Killer LAN! What makes ASRock Fatal1ty Z87 Killer Series motherboards so special is that it adopts Killer™ E2200 Intelligent Networking Platform, which boosts the performance of online games, high quality streaming media and other time sensitive UDP (User Datagram Protocol) based applications up to 5 times! Experiments at our lab have proven that Killer LAN is especially good at reducing the latency in online games, for instance the latency in League of Legends can be reduced by 136%, and the latency in Diablo3 is reduced by 60% and DOTA2 by 47%. When it comes to professional gaming, even millisecond decisions may turn the tides of war, either you kill LAG, or be killed by LAG. Hence with the onboard Killer E2200 LAN solution, LAG will never be an excuse for losing anymore. * Test results may vary depending on the setup, internet environment and time. Besides boosting the networking performance for UDP based applications, Killer LAN also automatically detects and accelerates game traffic ahead of other network traffic for smoother, stutter free in game performance and the competitive edge, giving users the lowest latency for game data on the most controllable network hardware available. Gaming Armor and A-Style isn't missing the killer party either! For CPU power, ASRock Fatal1ty Z87 Killer Series boasts Hi-Density Power Connectors that reduces 23% power loss and decreases the power connector's temperature. Meanwhile, there's 15? Gold Fingers within the VGA PCIe slot that delivers triple performance than usual. An additional SLI/CrossFireX Power Connector to provide more juice and stability for graphics cards. There's also the whole Purity Sound™ onboard audio solution for the pickiest ears and 600 ohm headphiles, and HDMI-In for connecting a secondary device to your PC while sharing the same monitor. The ultimate keyboard and mouse enhancement utility Key Master? You betcha! And how could anyone forget the best live broadcasting and recording tool XSplit, we are giving away the $24.95 three month premium license for free again with the Killer Series! As usual, an awesome motherboard dedicated for gaming deserves Premium Gold Caps to ensure stable performance and extra long endurance. At the same time, the motherboard uses Digi Power to provide the CPU Vcore voltage more efficiently and smoothly. Next to the gold caps are the 8 Power Phase design for delivering smooth power with the lowest temperature, so that users may overclock and squeeze out every drop of performance effortlessly. As for the memory, be prepared for a jaw breaking 3050+(OC) MHz Dual Channel DDR3!